Can Doppelganger copy an insane character? choose a non-unique character in play. If a card copies another card’s text or effect and the text includes self references (i.e. the card’s title) is it replaced by the card’s title that is copying the effect? Copying a character’s text box does just that. All examples of a card’s name remain unaltered, and as such refers to cards of that name only. Note, though, that Doppelganger copies the title as well as the text of the chosen card, so self-referential effects should still be valid in that case. 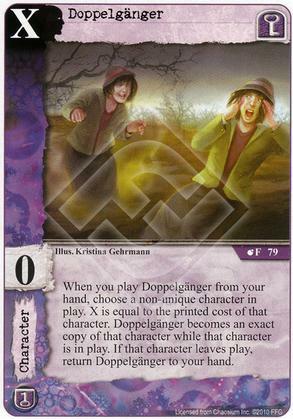 You know, I haven't used Doppelgänger for a while but early on when I started playing it seemed pretty popular. I especially liked having a way to get extra copies of characters that benefit from multiple copies in play or discounting characters like Servant of Glaaki. The best use I've seen for it was in a two-faction Mi-Go deck. It's a good card, but in recent years, it was superseded by other great cards on the restricted list - at least for me. I can see how the effects in a Mi-Go deck could be amplified quite nicely. Fleeting Guise is nice, but nothing can duplicate the Doppelgänger. I'd love to put him in my deck with Bringer of Fire, but Meiger is too key to the deck. Maureen (the Artist/Lunatic) is my very poor substitute, and Fleeting Guise gives me temporary Doppelgänger goodness. I assume the Doppelganger would benefit from Resilient if it copied a Baka (or similar Resilient non-unique character). The Doppelganger would be a copy of the Baka until it leaves play. Rules on Resilient read "when the Resilient character WOULD leave play." The Resilient would seem to take effect before the Doppelganger has left play, and thus, before the Doppelganger has ceased to be a copy of the Baka.